There’s a lot that goes on after a buyer’s offer is accepted by the seller. And a key factor in getting to closing day is the home appraisal by the lender. When the appraised value of a home comes in below the contract price, it could cause the sale to fall through. No new home for the buyer and no final sale for the seller. This does happen even in the DC metro area despite the bidding wars over homes. Sometimes the price gets pushed up more than what the recent sales would suggest is the value of the home. What can you — as a buyer or seller — do to prevent a low appraisal or, in the event of a low appraisal despite doing everything right, still have the sale go through? Read our strategies and insights below and prepare for one of the most important yet overlooked part of a home sale—the appraisal. First, let’s discuss the basics of the appraisal process—what it is and why it’s a necessary step as part of a purchase. A bank needs to make sure that the money they are lending for a home is for a home that is habitable, exists and also that they are not lending more than the value of a home in case of the worst case scenario, which is foreclosure. To that end, the bank will hire a licensed appraiser to visit the home and do two things. One, the appraiser needs to make sure the home is habitable and two, the appraiser tours the home to make notes about how it compares with the other homes that have recently sold nearby. These homes are called comparable or “comps” for short. Then, the appraiser will look at the comparables (sales over the last six months) to help determine the current value of the home that someone is buying. The valuation is also based on market trends, supply and demand, time on market, and takes in consideration any extenuating factors such as upgrades or something like being on a higher floor or end unit. For a condo unit, an appraiser will consider the number of units in the condominium community , how many are on the market and how many were sold. The most weight is given to homes that have sold in the same building since buildings are so different, even in the same neighborhood. The appraisal process went through a change a few years back when the Home Valuation Code of Conduct was passed. This law was meant to make appraisers more independent and not “hired” by the real estate agents, buyer, seller, or bank handling the transaction. But in some cases, appraises may not be local to the area where they were appraising homes, especially when appraisal management companies are involved. There’s been some questioning of how well these appraisers know the neighborhoods and the “true” value of a home when an appraisal comes in too low. If an appraisal comes in lower than the contract price, it may mean the end of the sale with this particular buyer. However, there are steps you can take to help avoid this and to also move the sale along. Provide details on any home improvements to the appraiser so nothing is missed. Your agent can contact the lender so they can connect with the appraiser who is hired to evaluated your home. Appeal the appraisal for a reconsideration of the value of the home. Provide the comparables you and your agent think represent the home’s value better and why. You will need to show any discrepancies between the appraisal and any improvements or unique features of the home. 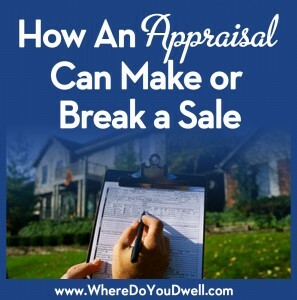 Ask for another appraisal, but you would have to pay for it. However, if it’s an FHA loan, an appraisal stays with that home for 6 months so you can’t ask to switch lenders or get a new appraisal. Renegotiate with the buyer and to offer a lower price or pay for closings costs. If you don’t have any other potential buyers, you may need to make such accommodations so that the sale does go through. If you’ve got an all cash buyer in the mix, you won’t have to deal with a bank or appraisals at all. That’s a big plus as a seller. If you’ve found a home you love but the appraisal comes in too low, you’ll need to consider several options. Should you still purchase the home if the value is lower? Do you think the appraisal is not accurate in the current demand or the market? It’s good to have a strategy in place. Remember, the seller wants to sell their home. Even though they would love the higher contract price, they may have to renegotiate with you but most likely will appeal the low appraisal as a first course of action. If you think the appraisal is flawed, you can challenge the appraisal. As a buyer, you now have the right to receive a copy of appraisals and computer valuations and other data. Switch lenders to start over again with a new appraiser. Save more money so you have more leeway in putting more down or making up the difference on a low appraisal if you truly want the home and there are other buyers in line to snap it up. Work with the buyer to see if they will lower the price or help pay for some of the closing costs or any other costs. Make sure your offer included an appraisal contingency so that you do have the option to exit the sale if it the value of the home is lower than the contract price. However, having this contingency may weaken your initial offer if it’s a competitive market. As you can see, a lot goes on “behind the scenes” during the appraisal. The good news is that both buyers and sellers have options to continue the sale if the appraisal comes in too low as long as you know how to navigate all the “what ifs” with our tips above!